- Comprehensibility: a belief that things happen in an orderly and predictable fashion and a sense that you can understand events in your life and reasonably predict what will happen in the future. - Manageability: a belief that you have the skills or ability, the support, the help, or the resources necessary to take care of things, and that things are manageable and within your control. - Meaningfulness: a belief that things in life are interesting and a source of satisfaction, that things are really worth it and that there is good reason or purpose to care about what happens. The purpose of this post is not indented to act as guide for the perfect computer setup or routines for the co-workers. This is rather some thoughts and ideas on how to turn a new co-worker into a confident, independent part of the team with a "sense of coherence" and perhaps a friend for life. Make sure that you are prepared for taking care of the new colleague before he or she arrives. There is some stuff that might take some time to fix. It might be necessary to order things - like a new computer, cell phone, a chair or a desk. Except from the hardware, verify that all needed software licenses are ordered beforehand. Make sure that the colleague will have access to all support systems that’s not under control by the team e.g. login to the AD, management systems for time reporting and salary. It’s also important that the colleague has access to the building. Things that are controlled by the team and easy to fix are not that important, since the new colleague will become part of the team. The key is to get rid of all impediments that takes time to fix and are not controlled by the team. A well-presented introduction that explains the vision and core values of the company acts as a foundation for the rest of the career and will make it easier for the new colleague to strive against the same goals as the rest of the organization. Give the new colleague a short introduction to the different divisions of the company, to make him or her feel safe, independent and aware of where to turn if problems occur. Make sure that another team member team-up with the new colleague during the first stand-up meeting. They should start on a new task with low complexity together. This is a brilliant opportunity for exploring the code base, interesting design choices, code standards, how we write tests, etc. During this phase, take care of all necessary setup needed for a developer that’s within control of the team. This could be things like access control to the versioning control, issue tracking, continuous integration server and DB. This will add transparency, and give a good overview for the new colleague of what’s needed to get up and running. 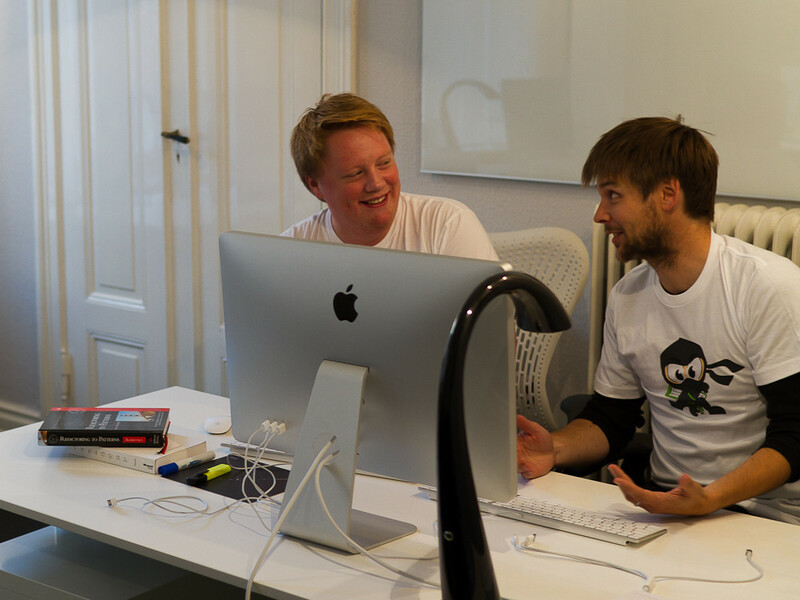 Work together on the task and make sure that you’re making a push to a new feature branch. I don’t think that the preparations above will cause any overhead for the company, but rather a nice way to say to welcome. Don’t forget about soft rules and fun stuff, like routines for lunch dates and after work arrangements. How do you think the first day should be organized for a new co-worker?